"Fair and balanced" Fox Nation was clearly very interested in a Public Policy Polling poll (via Hot Air) which found that Republicans Mike Huckabee and Mitt Romney are running even with President Obama. 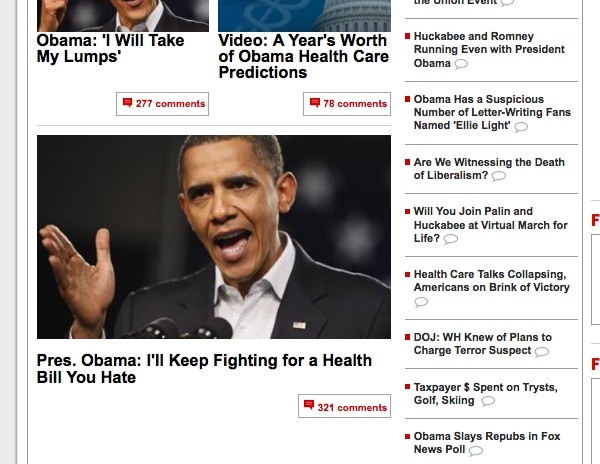 Fox Nation was so interested in that poll that it was hyped not once but twice on their home page. At the moment, the story is one of the big headlines at the top of the page. There's just one hitch. Fox News did their own poll which found, as Fox Nation described it, "Obama slays Repubs." Granted, Huckabee was not one of the candidates Fox News polled about. But Romney was and Obama beat him by 12 points. Fox News' own poll is included on Fox Nation - it's just much farther down the page than the other two two headlines, at the very bottom of the "Politics" section. Does Fox Nation not trust their own poll or are they just more interested when Obama doesn't look so good? I report, you decide! Screen grabs after the jump. H/T Ira Rosofsky.